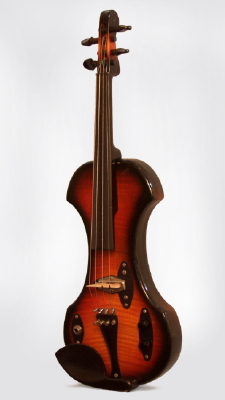 Fender Electric Violin, c. 1969 - 1970, made in USA, 2 tone red sunburst lacquer finish, maple body and neck. Has an elongated body with an internal pickup system, 2 knobs and a jack on the bass side of the top. The neck is detachable and has a center routed peghead, ebony fingerboard and tuning pegs. Overall Length is 24 3/4 in. (62.9 cm. ), 8 in. (20.3 cm.) wide at lower bout, and 1 1/2 in. (3.8 cm.) in depth at side, taken at the end block. Scale length is 12 1/2 in. (318 mm.). Excellent + Condition.